It had been a difficult weekend. He’d made an unexpected reappearance in our lives on Saturday afternoon having been in hospital for an operation to remove an in-growing toenail. He then went straight down the pub, stayed out for most of the night and slept until Sunday lunchtime, by which the time the toe was oozing yellow and black pus. I told him I didn’t think sitting by a fire on a dusty sofa next to some mouldy wallpaper was the best way to cure what was clearly an infected wound. He ignored me, so I went out to buy a lettuce to build up my stash of 20ps to use at the launderette so I didn’t have to ask the obese attendant for change. I then sat in my bedroom sulking, wearing a scarf because it was so cold, wishing his whole toe would fall off and he’d have to go back to hospital for the rest of the term. We’d never really got on. He used to leave CDs of dance music playing all night and I used to sneak into his bedroom to turn them down, then deny all knowledge when questioned in the morning. He hid my favourite tea mug. I knocked his razor blades down the toilet, then had an attack of guilt and put my hand down the bowl to retrieve them. A few weeks earlier I’d walked out of a screening of Showgirls at the Odeon cinema on Allerton Road, which drove him insane. I’d done it partly so I had something to write about in my review for the university newspaper. He just couldn’t understand why anyone would choose to leave a film before it had finished. His response had been to start interrupting me while watching Our Friends in the North, usually 10 minutes before the end of each episode. The weekend had ended up with me up in my bedroom trying to keep out of the way of the septic toe and its bigoted entourage. I’d crept out of the house and run through the rain to buy a Mars bar from Threshers – or Huttons as it had just become – then stayed up to watch Once Upon a Time in America, the first half of which Channel 4 were showing that evening. There are more agreeable ways to pass the 48 hours before a trip to Liverpool FC’s ground. If I’d been unable to sleep due to excitement, which I’d wager is what most people feel the night before seeing Anfield for the first time, I’d have been in a more tolerable mood. Instead I was ratty and shabby and at feeling odds with everything. And though I’d lived in Liverpool for only 18 months, that was long enough for me to know I was not in the ideal frame of mind to deal with Lime Street railway station. I was to meet my sister on the 10.56 train. It was she who really wanted to go to Anfield. She’d been a Liverpool fan for a few seasons and had been itching to visit the ground. Truthfully, I wasn’t that bothered. I’d probably have made it through my entire 12 years of living in Liverpool without seeing Anfield had it not been for her. But I was more than happy to do something different with my Mondays. My timetable for this term had given my only one thing to do on this day: a tutorial on US 20th century history at 9.30am. Playing travel guide to my sister was, if nothing else, a step up from confronting the obese man in the launderette. Lime Street station was colder than usual. Never a particularly temperate place even in high summer, today the place resembled a noisy refrigerator. Outside it was close to freezing. Inside was worse. It was no place for loiterers or mopers. I was doing both, for my sister’s train was late. When it arrived, she was not on it. After cursing splenetically for a few minutes, I realised I didn’t know what to do. Should I hang around in case she turned up on a later train, even though I’d no idea when that might be? Should I go back to the house and wait there, possibly for a phone call from her en route? Or should I ring my mum to see if she knew anything? “She’s not turned up and I don’t know what’s going on,” I shouted into the public telephone. “Well I’ve heard nothing and I’m not sure what I can do,” my mum replied. I tried ringing the house. No reply. Maybe everyone was too busy toasting their toes, or had gone down the pub again. In the end I stayed put. I walked from one side of the concourse to the other, then back again. I watched the pigeons. I went outside and looked in the windows of all the poky, miserable shops that used to huddle in front of the station and which are now, thankfully, long cleared away. I buried my chin deeper into my scarf. I probably sang something. It was probably The Bluetones. Around midday she arrived. “I did ring your house three times!” was her opening gambit. I was too cold to start an argument. She wanted to go to Quggins for lunch, and I wasn’t about to complain as I knew it would be warm inside. I think we had pizza. 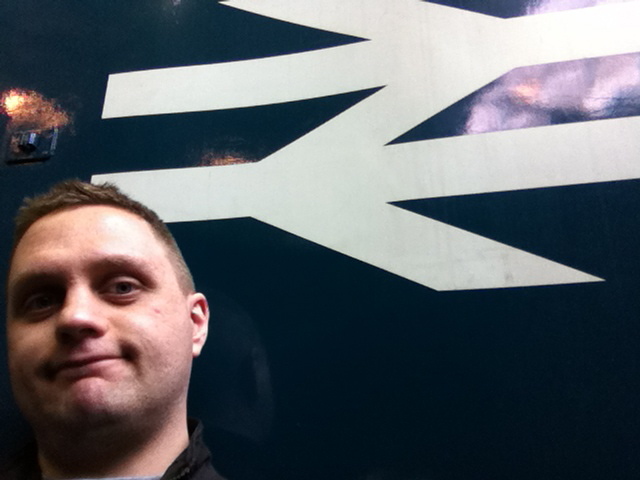 Then I steered her towards Liverpool Central station for a two-stop journey on the Northern line to Kirkdale. 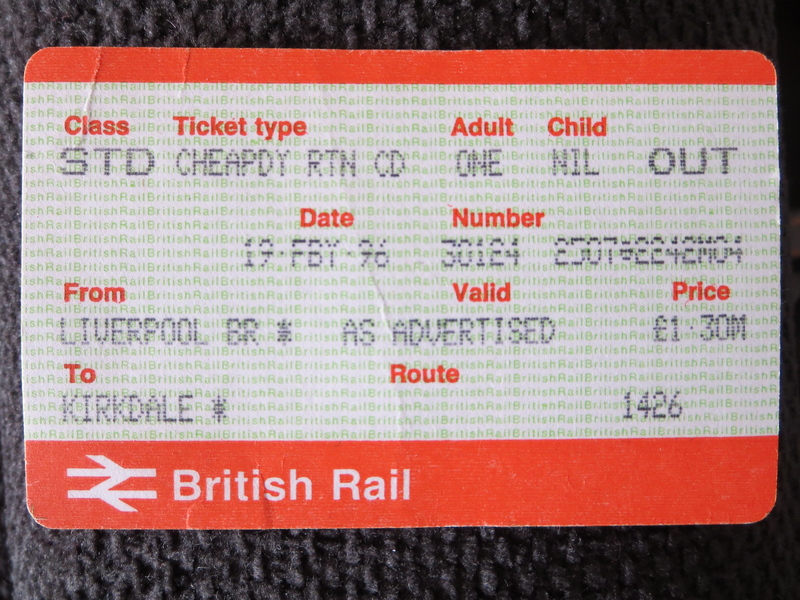 It was a cheap-day return and cost £1.30. I thought then, as I still do today, how utterly absurd there is no railway station within easy walking distance of Anfield. This was my sister’s first experience of Merseyrail and she was not impressed, though her attitude may have been coloured by losing her gloves just before we set off through rows of streets that seemed Siberian in both climate and appearance. A blizzard began as we neared the stadium. We huddled in a bus shelter waiting for it to pass. Everywhere turned quiet and still. I tried to behave very casually, as if to reassure my sister this sort of thing happened all the time in Liverpool, and oh no, the people of these streets were perfectly charming and would certainly come to our aid were the conditions to get worse and hail storms set in. She didn’t buy it. I knew this, and she knew I knew it. Within a few minutes the blizzard was over. Yet the stillness in the air persisted. It was all rather curious. I then realised it was connected with what was going on at Anfield itself. Bob Paisley had died a few days previously; the place was still in mourning. Outside the gates was a field of flowers, freshly covered with snow. People were moving about the place in a slow, considered way. I held back; my sister went up for a closer look, poking her face through the gates. I doubt all of this was what she was expecting, but just to be here at all was enough for her. Later on we got a bus back to my house and I fell on an old woman when the driver braked suddenly. On arrival we went straight into the living room to sit as close to the fire as we dared. No septic toe was to be seen, or any other part of its owner, but even if there was, I think my need for warmth would have overridden my gripes of the previous few days. That evening my sister’s train back got stuck in snow. I was too tired to watch part two of Once Upon a Time in America. The following morning I treated myself to my first ever Muller Crunch Corner. The toe had to be operated on in hospital and my housemate ended up having to retake the entire academic year. The three-bar fire turned out to have been faulty and in the autumn of 1996 our now ex-landlord was taken to court. I didn’t go back to Anfield until 2008. Written by Ian Jones Posted in My back pages	Tagged with Another post where I talk about toilets, Liverpool, Students - tsk!